Update: TonyDoug Wright and Bret Kinsey will be in attendance at the Champion City Con on Saturday, September 10, 2011. Be on the lookout for people wearing Champion City Comics stickers!! After thirty years of reading comic books and two years of running this webcomics site, I've decided to make my first appearance at a comic book convention also known by the all-too-familiar term, "con". "It's twue" in a Madeline Kahn kind of way that I should have made an appearance at a con during my lifetime, but I'm Generation X, a true slacker. It's time to make up for lost cons. Saturday, September 10, 2011, I will be back in my hometown of Springfield, Ohio to experience the third annual CHAMPION CITY CON at the Shouvlin Center which is located on the campus of Wittenberg University. The event will be held from 10:00 am until 6:00 pm. Admission is $4.00 per person, while children under the age of 12 are free as long as they attend with a paying adult. Guests include Tim Seeley, Marc Sumerak, and Daniel Leister. 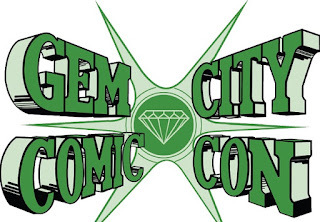 If you've been paying attention then you will have noticed that Champion City Comics and the Champion City Comic Con have a Springfield, Ohio connection. Why? Springfield was home to a company that developed a "Champion" brand of farm equipment and we were dubbed The Champion City. Now you know, and knowing is half the battle.